The History of New Holland, from its First Discovery in 1616, to the Present Time. With a particular account of its produce and inhabitants; and a description of Botany Bay: also, a list of the Naval, Marine, Military and Civil Establishment. - Plate : 'Robinetta'. This plate shows a young girl, depicted three-quarter-length, seated in a landscape. On her right shoulder is a bird. 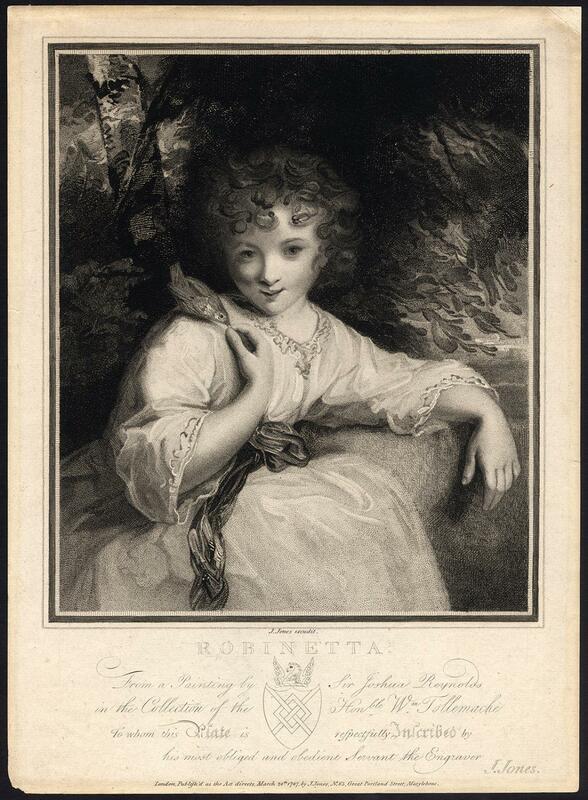 The original painting 'Robinetta' by Sir Joshua Reynolds (c.1786), which this print is taken from, is in the Tate Collection. Stipple engraving / mezzotint engraving on a verge type handlaid paper. Description: This original antique print was published in England, dated 1787.Artists and Engravers: This plate engraved by John Paul Jones after Joshua Reynolds. John Paul Jones (c. 1745-1797) was a British engraver. He was appointed engraver extraordinary to the Prince of Wales, and was also the principal engraver to the Duke of York. He produced a large number of portraits, mainly after Reynolds, Romney and other contemporary painters. He was both a mezzotint and stipple engraver. Joshua Reynolds (1723-1792) was an influential English painter of the 18th century. He specialised in portrait painting and the 'Grand Style' of painting, which emphasises on idealisation of the imperfect. Condition: Good. General age-related toning and light staining/soiling from handling as visible on image. Edges browned. A few very small tears in the margins, not affecting image. Top right and bottom left corner minimal paper loss. Please study scan carefully. Storage location: DP-B6-19 The overall size is ca. 10.6 x 14.8 inch. The image size is ca. 9.3 x 11 inch. The overall size is ca. 27 x 37.5 cm. The image size is ca. 23.5 x 28 cm. - Antique print, titled: 'The Soliloquy'. 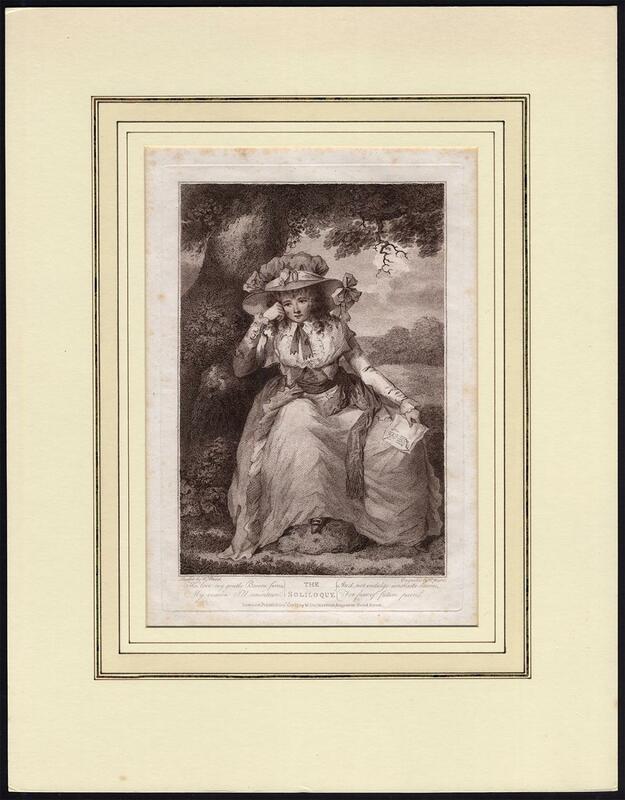 It shows: ('Tho' love my gentle Bosom fires / my reason I'll maintain / and not indulge unchaste desires, / for fear of future pain') A woman seated against a tree, contemplating love, with sheets of paper in her hand. Nice work of one of the best English engravers. Delicate and rare. Important Note: This print is sold with matting, which adds substantially to shipping cost. We can ship without matting. Inquire about reduced pricing. Stipple engraving on a verge type handlaid paper. Description: Published by W. Dickinson in London, 1787. Separately published master print. Our definition of a Master Print is a seperately published print or series of prints, not being an illustrative print to a text. 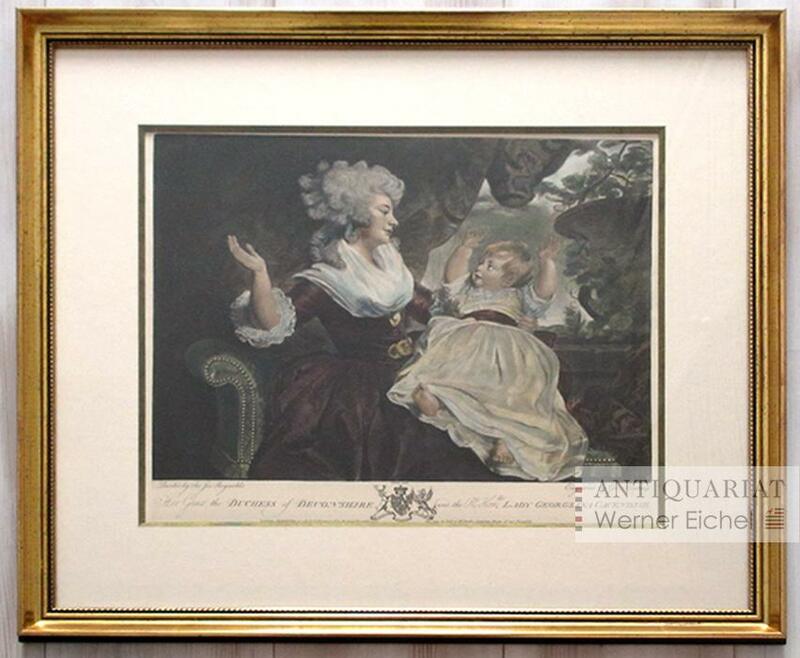 These can both be prints made by old masters (artists) or prints made by others (artists, engravers, etchers) after old masters.Artists and Engravers: Engraved by William Ward after his own design. William Ward (1762-1826) was an English engraver of mezzoting and stipple engravings, the son of James and Rachael Ward, and the elder brother of James Ward. The partnership of William and James ward produced the best that English art and engraving had to offer. William was married to Maria Morland (sister of engraver George Morland). Condition: Good, given age. Margins quite foxed, minimal foxing in the image. General age-related toning and/or occasional minor defects from handling. Please study scan carefully. Professionally matted. Not examined out of matting. Storage location: DPO-81-02 The overall size is ca. 17.1 x 22 inch. The image size is ca. 9.3 x 13.4 inch. The overall size is ca. 43.5 x 56 cm. The image size is ca. 23.5 x 34 cm. Critik der reinen Vernunft. Dritte (3.) verbesserte Auflage. 8vo (. XLIV S., 884 S. Pp. d. Zt. m. RSchild. Rotschnitt. Warda 61. - Ausgabe zu Lebzeiten Kants. 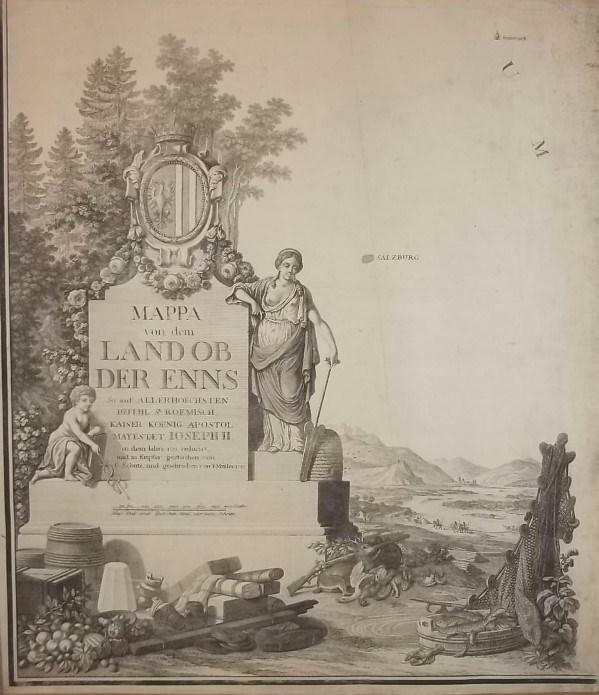 Folgt der maßgeblichen zweiten Ausgabe von 1787 mit dem ausführlichen Vorwort. Hier der erste Druck dieser Auflage mit dem Titelblatt "verbesserte Auflage" wie in der 2. Ausgabe, das dann in "unveränderte Aufalge" geändert wurde. - Einband berieben u. bestoßen, kl. Eckfehlstelle am RSchild. Vorsätze u. Titelbl. etw. stockfleckig, sonst sauber u. wohlerhalten. [FIRST FLEET] ANONYMOUS, often mis-attributed to William Eden. London: John Stockdale, 1787. 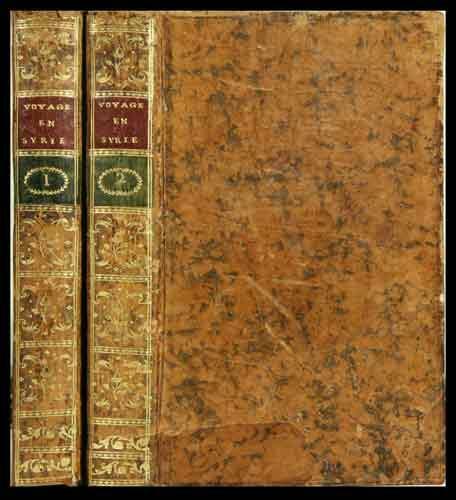 Octavo, with two folding maps handcoloured in outline; a most attractive copy in contemporary tree calf, the ornately gilt spine skilfully renewed. First edition of the essential precursor book for the First Fleet, the widely read description of Australia published to coincide with the departure of the Fleet for New South Wales, including a description of the planned penal colony and a description of the command of the settlement.Planning for the First Fleet proceeded rapidly following Lord Sydney's speech to the Lord Commissioners of the Treasury in August 1786. Not surprisingly, public interest in the radical scheme was considerable and the enterprising publisher John Stockdale rushed this book through the press to appease popular demand. The fine handcoloured maps detail the continent, Botany Bay and, most interestingly, the 'Passage from England to Botany Bay in New Holland 1787', showing the route that the Fleet must take.In keeping with the public contention surrounding the issue of transportation to New South Wales, this book includes an extract on banishment derived from William Eden's Principles of Penal Law. The inclusion of this extract has led to the traditional misattribution to Eden of the whole book, whose compiler in fact remains unknown to this day. The History of New Holland comprises a readable summary of information about Australia, including the early discovery of the Western Australian coast and the later explorations of Captain Cook on the eastern seaboard. As a description of Australia, it is essentially a synthesis for those unwilling to navigate the voluminous works of earlier mariners. It draws considerably on the work of William Dampier -- although the unknown compiler comments upon the 'roughness of his style'. Provenance: Private collection (Sydney). In fine condition. 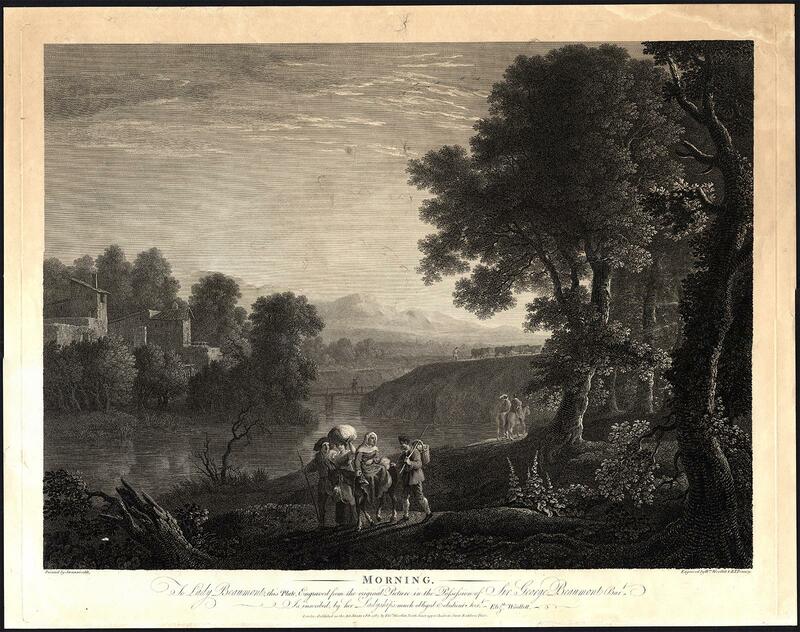 - Original antique print, titled: 'Morning'. It shows: a group of four travelling the countryside. One of the women is seated on a donkey. The others are all carrying wares. They are walking beside a stream and have just passed a bridge leading to some houses. Original etching/engraving on a vellin paper type. Engraved by Wm. Woollett and B.T.Pouncy after Swanniveldt. William Woollett (1735-1785) was an English engraver, born in a family originating in the Netherlands. His works combine etching, drypoint and engraving, and his works rank among the greatest English engraving. 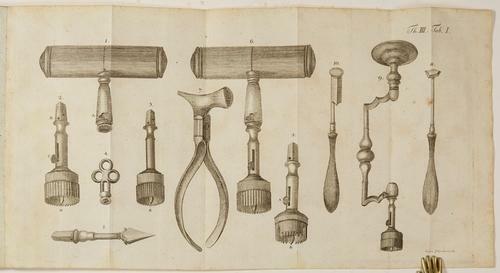 Benjamin Thomas Pouncy (?-1799) was an English draughtsman and engraver. He was trained by William Woollett, and is said to have been his brother-in-law. Later in life he produced some excellent engravings after contemporary masters. Herman van Swanevelt (1603-1655) was a Dutch Baroque painter and etcher. His first works date around 1623, and were produced in Paris. He moved to Rome in 1629, where he joined the Italianate Landscape movement. He is seen as one of the first painters to not include biblical and mytholgocal subjects in his paintings. Condition: Very good, given age. Top edge of the sheet a little browned, dampstain in the top right corner. Some small blemishes in middle of the image: small ink stains as a result of the printing process.General age-related light toning and/or staining from handling. Please study scan carefully The overall size is ca. 23.2 x 18.1 inch. The image size is ca. 22 x 17.3 inch. The overall size is ca. 59 x 46 cm. The image size is ca. 56 x 44 cm. Mappa von dem Land ob der Enns. So auf Allerhöchsten Befehl Sr. Roemisch Kaiserl. Koenigl. Apostolischen Majestät Joseph II. in dem Jahr 1781 reducirt und in Kupfer gestochen und geschrieben. C Stalker 1787 - 112 pages, 4pp adverts, engraved frontis showing a river scene with a gentleman fishing and a lady with flies to lower margin, some age browning to contents, original full calf binding rubbing to edges some soiling, hinges cracked but holding on ties, contained in a drop over box, leather title label to upper cover. The first edition of a popular book running to twelve editions. Best was keeper of his Majesty's drawing room in the town of London. 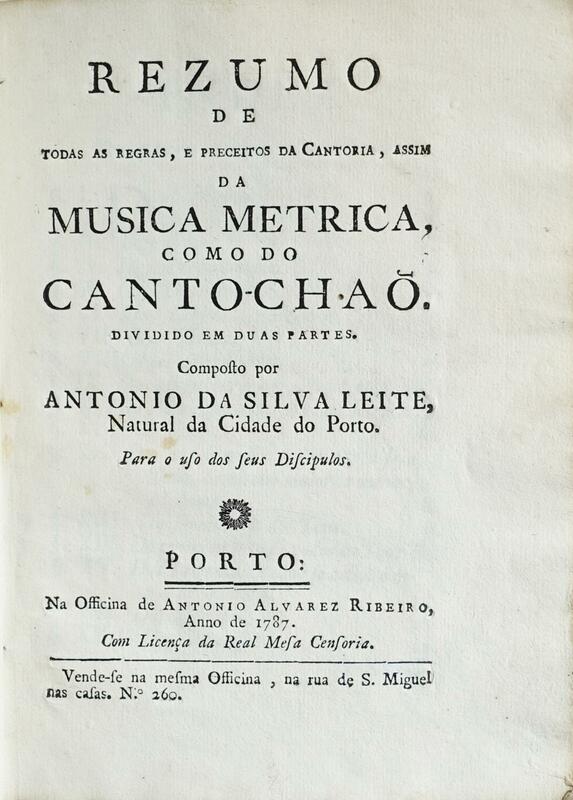 Rezumo de todas as regras, e preceitos da Cantoria, assim da musica metrica, como do canto-chão, dividido em duas partes. Composto por . para o uso dos seus discipulos. Ponderazioni sopra la contrattazione marittima. Ricavate dalla legge civile . 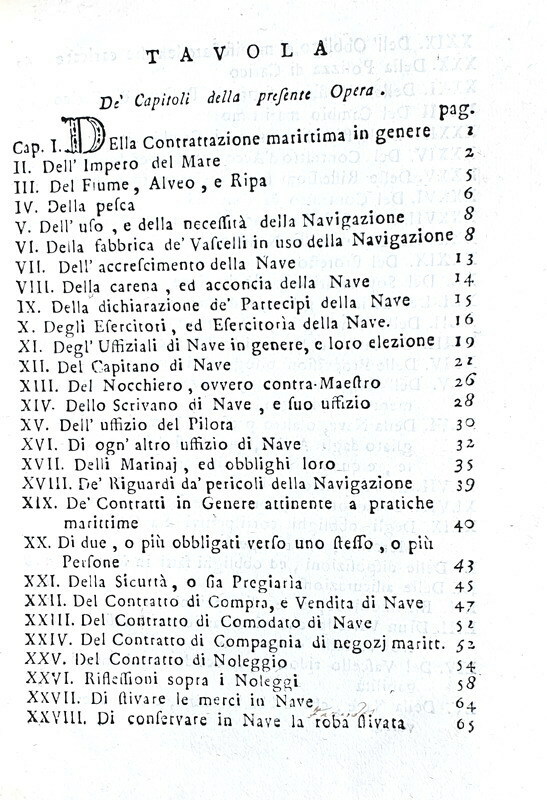 dal consolato di mare e dagli usi marittimi.Genova, dagli eredi di Adamo Scionico, 1787. Carte D'Asie diversie en ses principaux Etats. 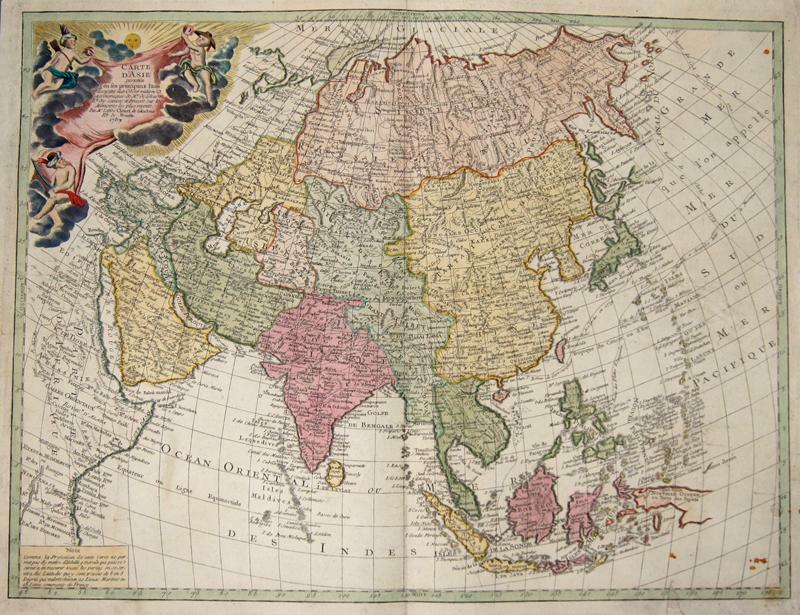 Artist: Clouet Jean-Baptiste-Louis Paris; issued in: Paris; date: ca 1787 - - technic: Copper print; - colorit: original colored; - condition: Missing parts at lower centerfold replaced; - size (in cm): 49 x 64; - description: Map shows total Asia from Arabia to Japan, ;with a decorative cartouche. 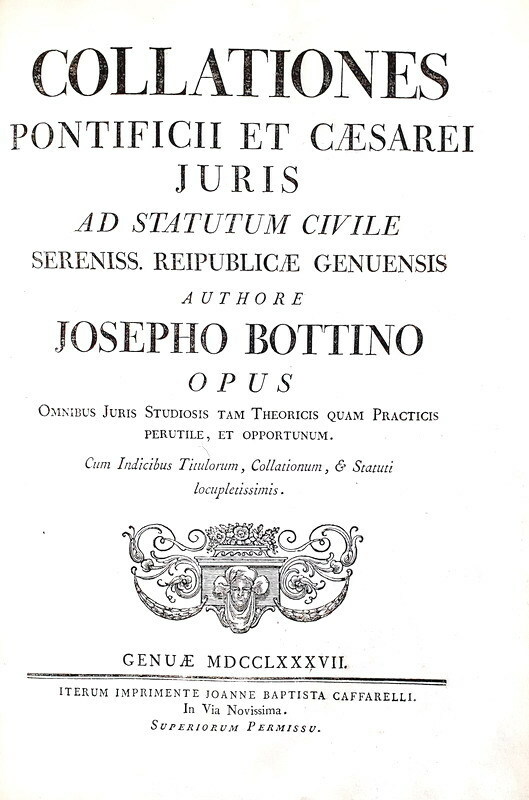 Collationes pontificii, et caesarei iuris ad statutum civile sereniss. reipublicae Genuensis.Genuae, iterum imprimente Joanne Baptista Caffarelli , 1787. Thalia (2 Bände, Heft 1 - 8 von 12). [Erstausgabe]. Erster Band: welcher das I. bis IV. Heft enthält. Zweiter Band: welcher das V. bis VIII. Heft enthält. VOLNEY, C. - F. ( Constantin François , Comte de). WIENER FRÜH- UND ABEND BLATT. Nr. 169. 1. May 1787 (frühe) bis Nr. 179. 8. May 1787 (frühe). Wien, Grill 1787. - ORBI 2,3:6194. Frank/Frimmel 64. Strasser 57ff. - elf aufeinanderfolgende Nummern dieser, jeweils früh und abends erschienenen Wiener Tageszeitung, wobei am 4. 5. abends und am 5. 5. morgens ?wegen Ausbleibung der Post? keine Ausgaben erschienen. 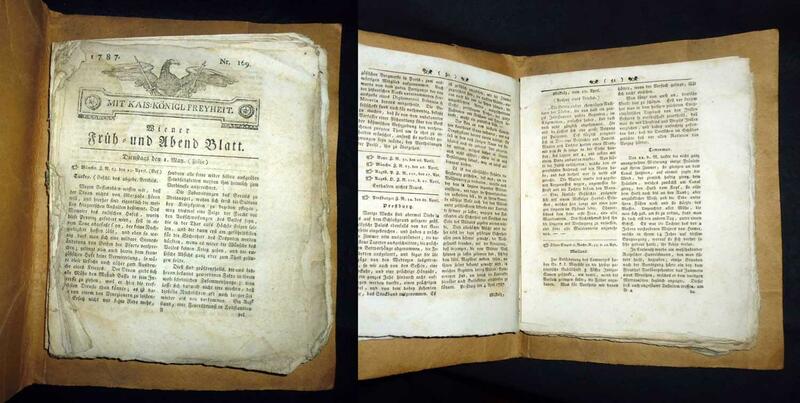 Die von Karl Grill verlegte Zeitschrift erschien seit 1786 und musste 1789 eingestellt werden. Kl.4°. S. 1-88. Ungebunden, mit Kartonumschlag, Vorderdeckel von alter Hand beschriftet, Rücken mit geringen Resten von alter Klebebindung, ursprüngliche Heftung entfernt, Blätter unbeschnitten, nur leicht gebräunt, teilw. etw. angestaubt u. schwach wasserrandig, Anfangsnummern mit geringen Fraßspuren (ohne Textverlust) im Innenfalz. - Außerdem beiliegend: Wiener Zeitung. Nr. 76. 20. September 1806. S. 4745-4792. St. Petersburg: S.K.R., Typ. of Vilkovsky and Galchyonkov, 1787. 72 pp. 18x11,5 cm. 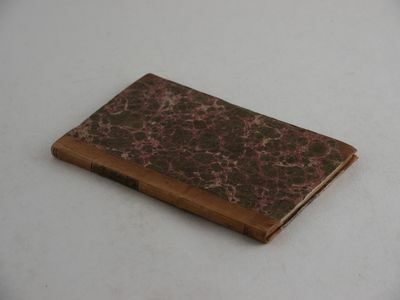 Contemporary light brown half leather with marbled boards and a colour stamped title label on the spine. Bookplate of Sergey Sobolewsky on the front paste down endpaper, paper label with a pencil note by a Soviet bibliophile on the front free endpaper, paper label of Vasily Klochkov's bookstore and a stamp of a Soviet bookshop on the rear pastedown endpaper. Very good. Corners slightly bumped, paper slightly age toned. First edition. Extremely rare. Interesting original travel account by the first Russian to cross the Atlantic and visit the Caribbean Islands. A merchant from Nizhny Novgorod, Vasily Baranshchikov (1756-early 19th century) went to a trade fair and lost considerable amount of money lent by fellow tradesmen. In an attempt to escape he went to Saint Petersburg and became a sailor on a ship bound for Copenhagen. There he was kidnapped and sold to a slave ship which brought him to Saint Thomas Island (then in Danish West India, now a part of the American Virgin Islands). There Baranshchikov served for two months in a Danish military garrison and was then sold as a household servant to a Spanish ''General'' in Puerto Rico. After a year of service Baranshchikov was released and went to Venice as a sailor on an Italian ship; near the Barbary coast the ship was captured by pirates and the traveler was sold into slavery to the Palestine. Baranshchikov was forcibly converted into Islam, eventually brought to Constantinople and married a Turkish woman. In 1785 he escaped to Russia via Bulgaria, Moldavia and Poland, returning to Nizhny Novgorod a year later. On request of his creditors he was put in debt prison, but released with the help of the local bishop. Baranshchikov went to Saint Petersburg and was received by Catherine II and representatives of Saint Petersburg high society. The Empress recommended him to write an account of his travels, which was first published in 1787. All author's fees went for the payment of his debts. The book contains lots of interesting details of everyday life in St. Thomas Island and Puerto Rico (like outfits and salaries of Danish soldiers, ceremony of taking military oath, descriptions of banana plants, coconuts, sugar cane, and coffee), description of Jerusalem and Constantinople, Baranshchikov's service as a Janissary in Turkey, and others. Printed during the Russo-Turkish war of 1787-91, the book became a bestseller and was published four times in the 18th century, all subsequent editions have a slightly edited finale and the ''Supplement, containing the description of Tsargrad [Constantinople] and Turkish spiritual, military and civil authorities''. The text of the first edition finishes with a complaint about Baranshchikov's bankruptcy and life in ''uttermost poverty'' after his return home; all subsequent editions have that part replaced with a praise to the generosity of ''many honorable people of Saint Petersburg'', who ''graciously relieved him from destitution'', the list of the ''honorable people'' includes over twenty names of the members of Russian high society, i.e. State Chancellor Count Alexander Vorontsov, first Russian Minister of Education Ivan Shuvalov, President of the Imperial Academy of Arts Ivan Betskoy, Baron Alexander Stroganov, and others. Our copy bears an armorial bookplate of Sergey Sobolevsky (1803-1870), a noted Russian bibliophile, bibliographer and poet of the Golden Age of Russian Poetry. He was a friend of Alexander Pushkin, Mikhail Lermontov, Adam Mickiewicz, Prosper Mérimée and many other European writers. Sobolevsky's library contained over 25,000 volumes, with the departments of geography and travels, Russian history, and bibliography and books on books. After his death, a part of the library was bought by the British Museum and Leipzig University, the rest was sold at auctions by Leipzig booksellers; the archive was bought by count Sergey Sheremetev and is now deposited in the Russian state collections. A note on the piece of paper attached to the first free endpaper was written by a Soviet bibliophile and reads: ''In the catalogue of ''Mezhdunarodnaya Kniga'' No. 21 from 1933 it is said: First edition of this book has never been registered and it is unclear whether it exists'' (Annotation #213). This copy is from the library of Sobolevsky and is the first, unknown edition. P.S. It is mentioned in Smirnov-Sokolsky's, vol. 1, p. 195'' (Smirnov-Sokolsky, Moya Biblioteka. M., 1969). The book also has a paper label of the bookshop of a famous Saint Petersburg antique book dealer Vasily Klochkov (1861-1915). Svodny Katalog 4575. No paper copies of this first edition found in Worldcat. There are only two copies of the second edition (Harvard, NYPL), and two copies of the fourth edition (Columbia University, State Library of Berlin). La Lire maçonne ou recueil de chansons des Francs-Maçons; revu, corrigé, mis dans un nouvel ordre & augmenté de quantité de chansons qui n'avoient point encore paru, par les frères... Avec les airs notés mis sur la bonne clef, tant pour le chant que pour le violon et la flûte. Nouvelle édition revuë, corrigée & augmentée. La Haye, R. Van Laak, 1787, in 12, de 12ff.-XVIpp.--536 pp., avec musique notée. in t., pl. veau blond moucheté époque, dos lisse orné, p. de t. rouge, encadrement d'une dentelle dorée sur les plats, avec doré au 1er plat la mention "Charlesworth Masonic Library", très bel exemplaire. 4e édition augmentée de ce chansonnier maçonnique peu commun. Il contient ici 270 chansons dont 50 en Néerlandais, la plupart avec les airs notés. Le premier auteur est en fait Jean Joseph Joniot dit de Vignoles. La vignette maçonnique du titre est signée "Frère Boily". ¶ Fesch 1442 - Wolfstieg 39707 - Kloss 1515 - Dorbon n°5138 - Cette édition manque à Caillet. Der Wienerische Hannßwurst oder lustige Reysebeschreibung aus Salzburg in verschiedene Länder. Herausgegeben von Prehauser (enthält außerdem: Anhang oder hannswurstische Träume auf jeden Monat eingetheilt von Johanne Wurstio). Dezauche/de l Isle, J.A. / G.
Procès-verbal des séances de l'Assemblée Provinciale de la généralité de Rouen, tenue à Rouen dans le mois d'août 1787. A Rouen 1787 - in-4, 44-416 pp., 4 tableaux dont 3 repliés, demi-veau fauve, dos à nerfs orné, tranches rouges (reliure de l'époque). Petit manque à la coiffe. Aufschluß und Vertheidigung der Enthüllung des Systems der Weltbürger-Republik. Nebst eine Bitte an die Leser. 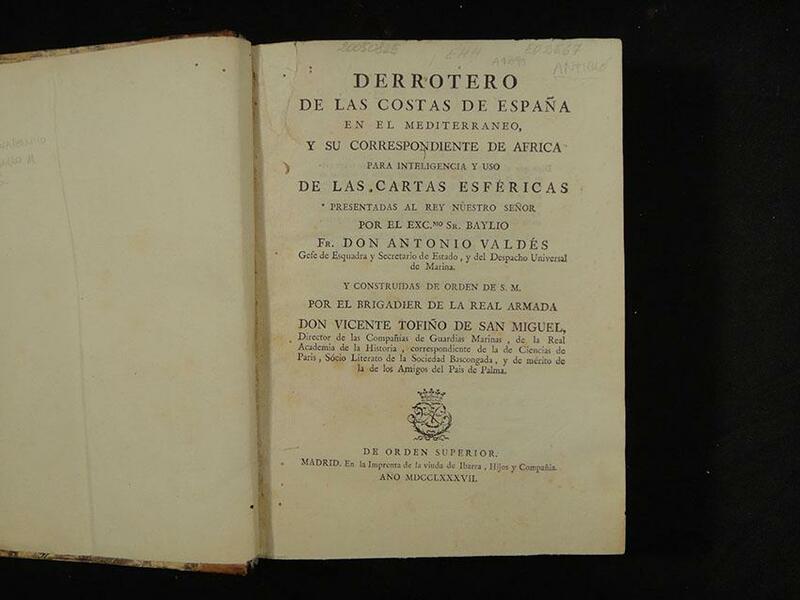 Mexico: Imprenta de Don Felipe de Zuniga y Ontiveros, calle del Espiritu Santo, 1787. ,344pp. plus plate and folding map. Small quarto. 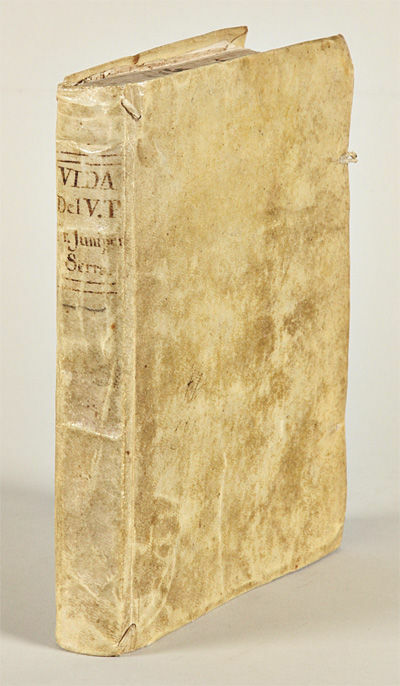 Contemporary vellum, manuscript title on spine. Vellum ties lacking. Front inner hinge cracked but holding. Some light soiling to fore-edge of first few leaves, minor soiling to rest of text. Very good. 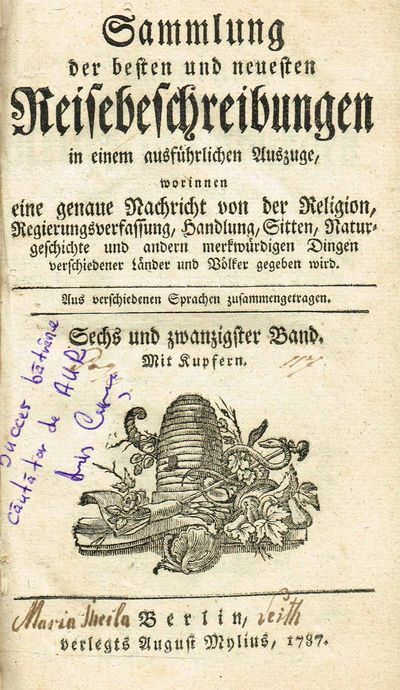 First edition, second issue, with "Mar Pacifico" printed on the map (see Wagner). This is also the issue of the text "pro" at the end of the index and with the phrase "a expensas de various bienhechores" preceding the imprint on the titlepage. An outstanding book on early California. Cowan, in the 1914 edition of his bibliography, calls this "the most famous and the most extensive of the early works that relate to Upper California." Palou was a disciple of Father Junipero Serra for many years, and his work is still the principal source for the life of the venerable founder of the California missions. "The letters from Father Serra to Father Palou [provide] interesting details on the various Indian tribes and their manners and customs, together with descriptions of the country....This work has been called the most noted of all books relating to California" - Hill. "Both a splendid discourse on the California missions, their foundation and management, and an intimate and sympathetic biography of the little father-present. Better, by long odds, than the bulk of lives of holy men, written by holy men" - LIBROS CALIFORNIANOS. "[The map] is of interest here because it seems to be the first on which a boundary line was drawn between Lower and Upper California" - Wheat. The map shows the locations of nine missions (of an ultimate total of twenty-one) as well as the presidios at San Diego, Santa Barbara, Monterey, and San Francisco. The plate is an allegorical portrait of Serra ministering to Indians. BARRETT 1946. COWAN, p.472. COWAN (1914 ed), pp.171-72. HILL 1289. GRAFF 3179. HOWES P56, "c." LC, CALIFORNIA CENTENNIAL 34. LIBROS CALIFORNIANOS, pp.24, 67. WHEAT TRANSMISSISSIPPI 208. WAGNER SPANISH SOUTHWEST 168. WEBER, p.77. ZAMORANO 80, 59. 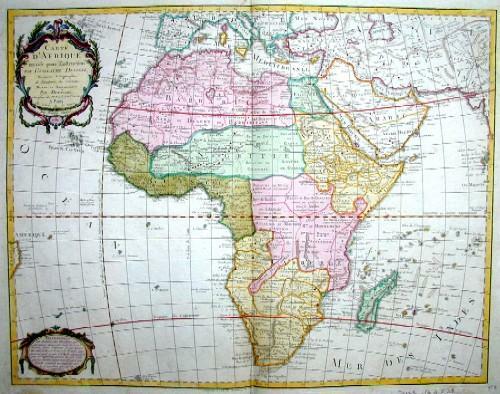 Tofiño de San Miguel, V.
Derrotero de las costas de España en el Mediterráneo y su correspondiente de Africa para inteligencia y uso de las cartas esféricas presentadas al Rey Nuestro Sepor por el Excmo. Sr. Baylio Fr . -. Folded twice, few smudges and faint spots.. Single leaf, approx. 6-1/2 X 3-1/2 in. written on one side; ink notation in another hand on the other side. 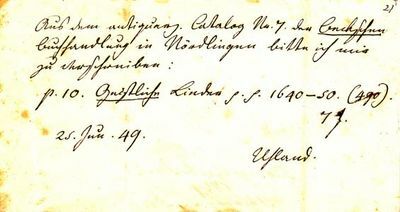 Note on which Uhland orders a volume of "Geistliche Lieder" from a bookseller in Nördlingen. Ludwig Uhland (1787-1862) set aside his early poetical inclinations to pursue a career in liberal politics and scholarship. A member of the Frankfurter Nationalversammlung following the revolutions of 1848, he would become a professor at Tübingen, where he helped establish the field of modern German literary studies. De Morbis nonnullis Limae grassantibus therapeia. Lehrbegriff der Wundarzneykunst, 3.Theil: Kopfband. Essai sur la maladie de la face, nommée le tic douloureux avec quelques réflexions sur le raptus caninus de Coelius Aurelianus. An Ordinance for the Government of the Territory of the United States, Northwest of the River Ohio. 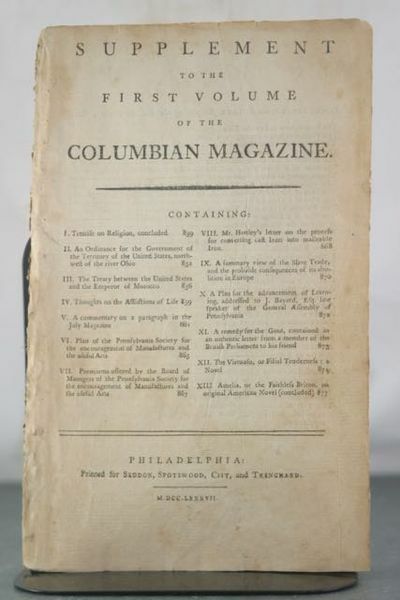 [in] Supplement to the First Volume of the Columbian Magazine. Seddon, Spotswood, Cist and Trengmard. UNBOUND. Philadelphia, 1787. 8vo, removed from larger volume, , 839-884 pp. An important law passed by the Confederation Congress on July 13, 1787, creating the Northwest Territory. A landmark law, creating the first Northwest Territory in the area surrounding the Great Lakes and setting a precedent for westward expansion based on the admission of new states rather than the expansion of existing states. 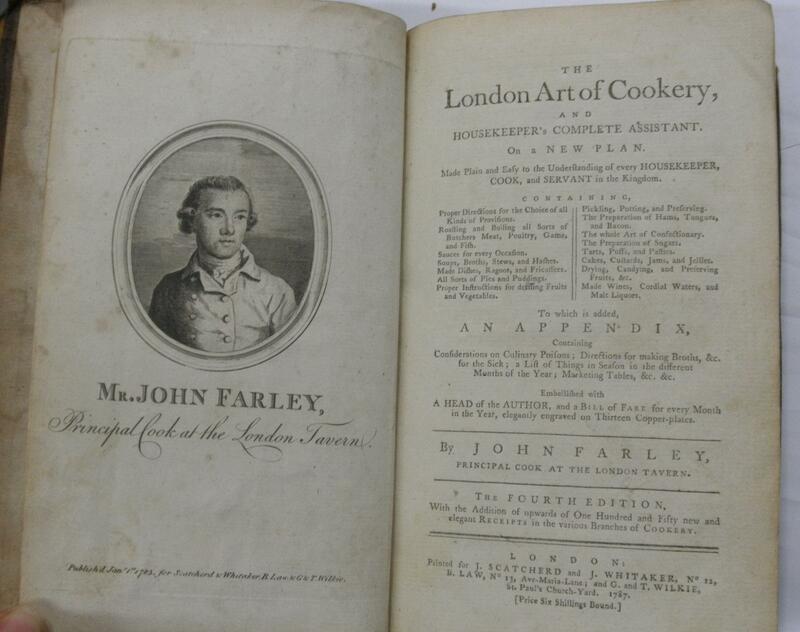 A bright example with one tiny marginal tear to title page, very good condition overall. . Very Good. 1787. First Edition. \"Fire - Water - Air - Earth\". Allegorien auf die Vier Elemente. Paris: Imbault [PN 100], [ca. 1787]. Folio. Full contemporary green vellum with large rectangular dark red morocco label gilt to upper with text within decorative borders gilt: "Au Nom de la Républiq. Frse. Premier Prix de Piano Decerné au Cen. Joseph Zimmermann Eléve au Conservre. de Musiqe. An 9." and dark red title label gilt to spine. 1f. (title), 235, [i] (blank) pp. Engraved. Text in French. A presentation copy to the noted French pianist, teacher, and composer Pierre-Joseph-Guillaume Zimmermann (1785-1853). Publisher's handstamp to lower margin of title. 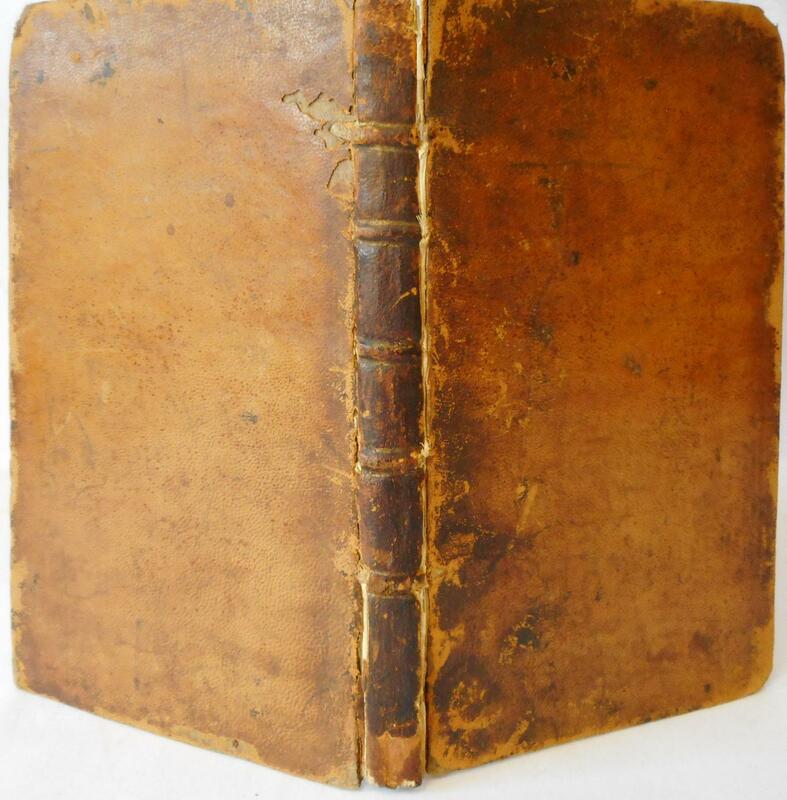 Binding worn, rubbed and bumped; spine torn and partially detached. Slightly worn and soiled; light to moderate foxing; small binder's holes to upper inner margins; tear to lower portion of pp. 193-194 somewhat crudely repaired; minor loss to lower outer corner of p. 199, slightly affecting music. First Edition, later issue. RISM A/I/7 S 199. BUC p. 912. 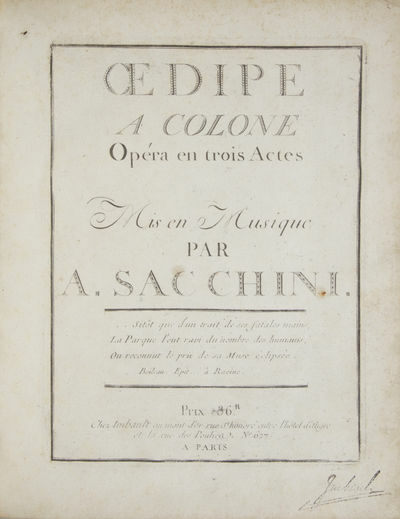 First performed at Versailles on January 4, 1786, Oedipe a Colonne was Sacchini's last completed opera, produced posthumously and widely acclaimed by contemporaries and historians alike. "Indeed, the many choruses and scenes of spectacle in his last operas not only show the strong influence of Gluck but also point the way to the grand opera of Spontini. 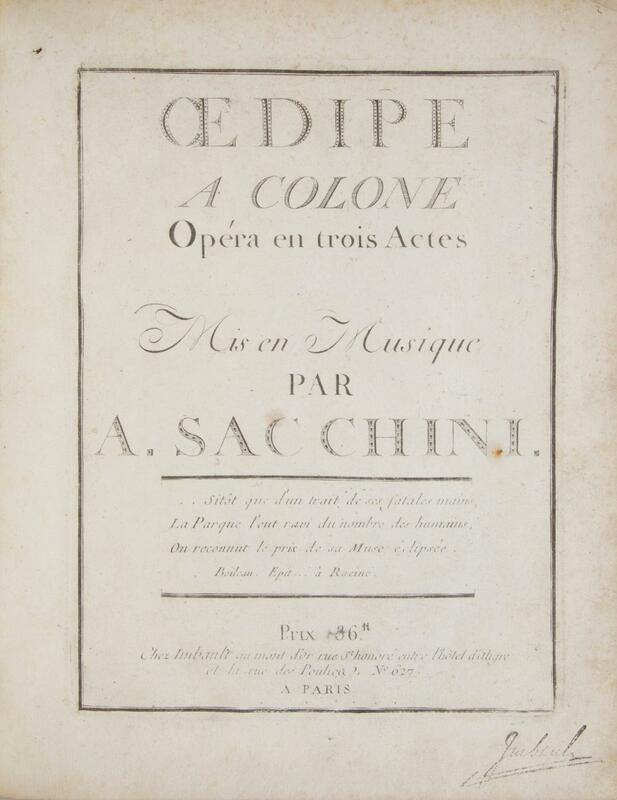 Dardanus and Oedipe emerge as true lyric dramas from which all unnecessary ritornellos and airs have been shorn... With his masterpiece, Oedipe, Sacchini admirably achieved a synthesis of Italian melodic style and Gluckian principles within a French dramatic framework." TNG Vol. 16 p. 372. "The son of a Paris piano maker, [Zimmermann] entered the Conservatoire in 1798 to study piano with Boieldieu and harmony with J.-B. Rey and then Catel. In 1800 he won a premier prix for piano (over Kalkbrenner) and in 1802 a premier prix in harmony; later he studied composition with Cherubini. From 1811 he assisted in teaching the piano at the Conservatoire and in 1816 was appointed professor. In 1821 he was selected to succeed A.-F. Eler as professor of counterpoint and fugue, but decided to teach the piano only and the vacant post went to Fétis. He was one of the most influential French keyboard teachers of his time; his pupils included Franck, Alkan, Louis Lacombe, Ambroise Thomas, Bizet and A.-F. Marmontel (who succeeded him in 1848). He also taught Gounod (who became his son-in-law). He retired early from public performance in order to devote himself to teaching and composition. His Encyclopédie du pianiste (1840) was intended to train the pianist both as executant and composer. He was a Chevalier of the Légion d'Honneur." Fréderic Robert in Grove Music Online. Briefe über Hernhut, und andere Orte der Oberlausi(t)z.
Wintertur, Henrich Steiner und Comp. 1787. (16) 184 p. Contemporary light blue Wrappers, 8° (A single wormhole in the text until page 159, because of this a few letters of the preface are lost. 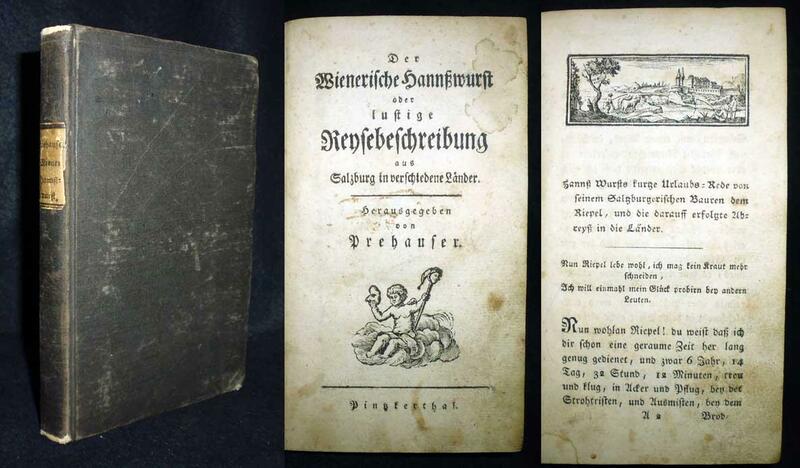 First edition of this rare description of the village Hernhut and its surroundings by Christian Gottlieb Schmidt, 1755-1827. The work contains 14 letters by Schmidt and provides a detailed description of the origins of the 'Hernhutter Brüdergemeine'.). Paris: Imbault [PN 100], 1787. First Edition, later issue. RISM A/I/7 S 199. BUC p. 912. "The son of a Paris piano maker, [Zimmermann] entered the Conservatoire in 1798 to study piano with Boieldieu and harmony with J.-B. Rey and then Catel. In 1800 he won a premier prix for piano (over Kalkbrenner) and in 1802 a premier prix in harmony; later he studied composition with Cherubini. From 1811 he assisted in teaching the piano at the Conservatoire and in 1816 was appointed professor. In 1821 he was selected to succeed A.-F. Eler as professor of counterpoint and fugue, but decided to teach the piano only and the vacant post went to Fétis. He was one of the most influential French keyboard teachers of his time; his pupils included Franck, Alkan, Louis Lacombe, Ambroise Thomas, Bizet and A.-F. Marmontel (who succeeded him in 1848). He also taught Gounod (who became his son-in-law). He retired early from public performance in order to devote himself to teaching and composition. His Encyclopédie du pianiste (1840) was intended to train the pianist both as executant and composer. He was a Chevalier of the Légion d'Honneur." Fréderic Robert in Grove Music Online.. Folio. Full contemporary green vellum with large rectangular dark red morocco label gilt to upper with text within decorative borders gilt: "Au Nom de la Républiq. Frse. Premier Prix de Piano Decerné au Cen. Joseph Zimmermann Eléve au Conservre. de Musiqe. An 9." and dark red title label gilt to spine. 1f. (title), 235, [i] (blank) pp. Engraved. Text in French. Binding worn, rubbed and bumped; spine torn and partially detached. Slightly worn and soiled; light to moderate foxing; small binder's holes to upper inner margins; tear to lower portion of pp. 193-194 somewhat crudely repaired; minor loss to lower outer corner of p. 199, slightly affecting music. [COMMISSIONER OF HIS MAJESTY'S WOODS, FORESTS AND LAND REVENUES]. An Account of all the Manors, Messuages, Lands, Tenements, and Hereditaments, in the different Counties of England and Wales, held by Lease from the Crown. As contained in the Report of the Commissioners appointed to enquire, into the State and Condition of the Royal Forests, Woods, and Land Revenues; With the Names of the Lessees, Dates and Terms of their Leases, Real Value, Fines, &c. To which is added, an Appendix, never before printed. London, printed by Stafford and Davenport, for S. Hooper; and Messrs. Robinsons, 1787. Oblong large folio. 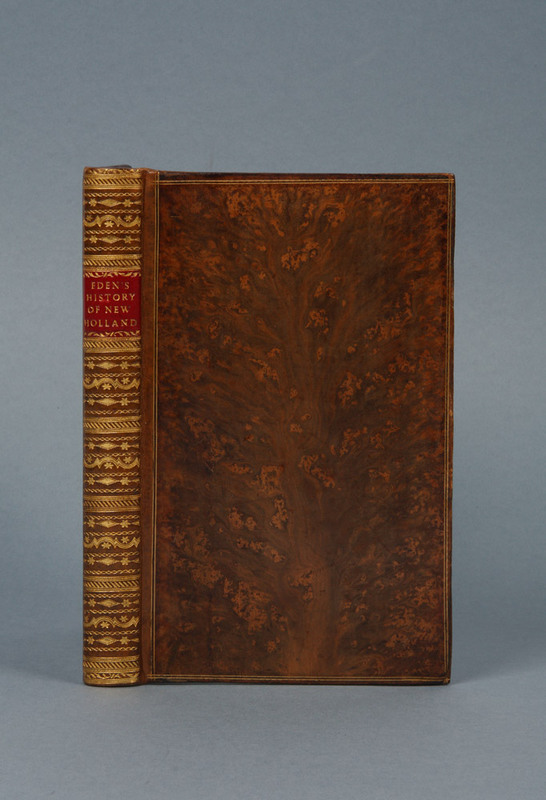 Contemporary dull tree calf, spine ornamented in gilt and with gilt stamped lettering-piece CROWN ESTATE, boards with gilt-ruled fillets, marbled endpapers, expertly re-backed with original backstrip; pp. [iv], 76, ; apart from very light spotting, a very clean and attractive copy; contemporary engraved armorial bookplate, ownership inscription, dated 1797, on verso of front fly-leaf. This is a directory of the Crown Estate, with tennants' names, descriptions of the properties and rent increases, with Middlesex (Greater London) taking up - naturally - the largest section, from page 21 to 58. Particularly fascinating are the descriptions of properties in Central London. Sotherans' location is described as follows: Jane Visc. Dowager Gallway had a fifteen and a half year lease of properties with a 'yearly value per latest survey of £90'. They are 'five messuages on the West Side of Swallow Street, and Two Messuages on the North Side of Piccadilly' (p. 50). - Very rare. Provenance: Viscount Strathallan, Stobhall, Perthshire. (Autografo) Bellissima lettera del Cardinale Onesti Braschi. Roma, 1787. In-4°, 4 pp., 9 righe di testo con data e firma. In perfetto stato di conservazione. Romoaldo (o Romualdo) Braschi-Onesti (Cesena, 19 luglio 1753 - Roma, 30 aprile 1817) è stato un cardinale italiano. 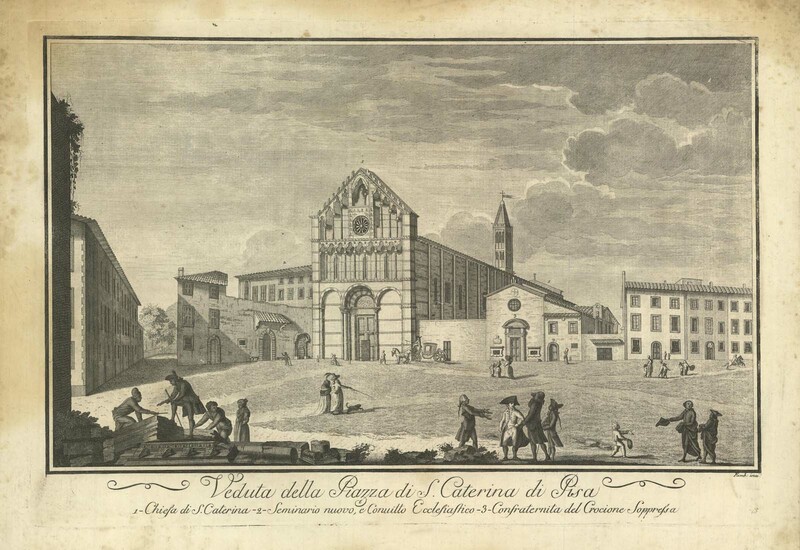 Nacque a Cesena il 19 luglio 1753, figlio del conte Girolamo Onesti, marchese di baldacchino, e di Giulia Braschi, sorella del cardinale Giovanni Braschi, futuro papa Pio VI. 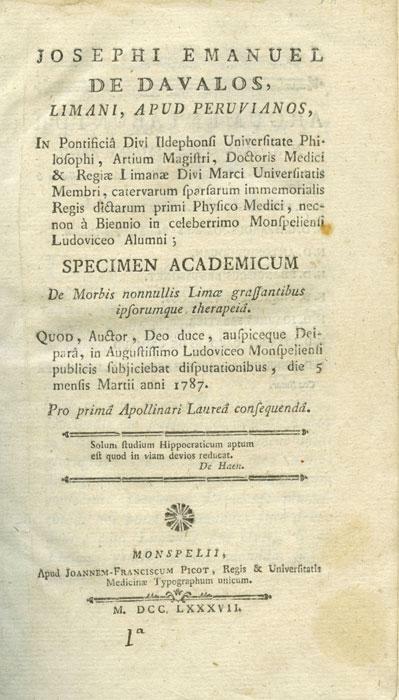 Dopo aver compiuto i primi studi a Ravenna presso il Collegio dei Nobili, venne chiamato a Roma nel maggio del 1778 dallo zio cardinale che nel frattempo era divenuto pontefice. Nello stesso anno, grazie al patrocinio del potente parente, venne avviato alla carriera ecclesiastica e nominato delegato apostolico in Francia, con l'incarico di consegnare la berretta cardinalizia ai neocardinali francesi Rochefoucauld e Rohan. In quell'occasione, stimandolo per la sua professionalità e per il suo ruolo di nipote del pontefice (quindi in vista di future e amichevoli relazioni con lo Stato Pontificio), Luigi XVI gli assegnò l'abbazia di Chaage nella diocesi di Meaux, con annessa una rendita annuale di 5.000 scudi. Dopo essere rientrato a Roma, il 5 settembre 1779, Braschi-Onesti venne premiato dallo zio per la buona riuscita della missione con la nomina a referendario del Supremo tribunale della Segnatura apostolica e nel 1780 venne nominato maggiordomo e prefetto dei sacri palazzi, carica con la quale diresse il fastoso matrimonio del fratello Luigi che venne celebrato dallo zio nella Cappella Sistina proprio nell'anno successivo. Nel 1782, in occasione del viaggio di Pio VI a Vienna, egli ricevette in consegna il testamento di suo zio e nel 1784 venne nominato Gran Priore dell'Ordine di Malta a Roma, ottenendo la decorazione di gran croce dell'Ordine dei Santi Maurizio e Lazzaro dal re di Sardegna Vittorio Amedeo III di Savoia. Uff. 4 pacc. Nouvel atlas des champignons. [Paris], Bordas, 1956-1967. 4 volumes. 4to. With 316 numbered chromolithographed plates after Chenantais and lithographed by Mourlot, 39 full-page black and white illustrations, and 68 illustrations in the text. Publisher's original cloth (each volume a different colour), in the chromolithographed green dust jackets. - Volbracht, MykoLibri 1787. 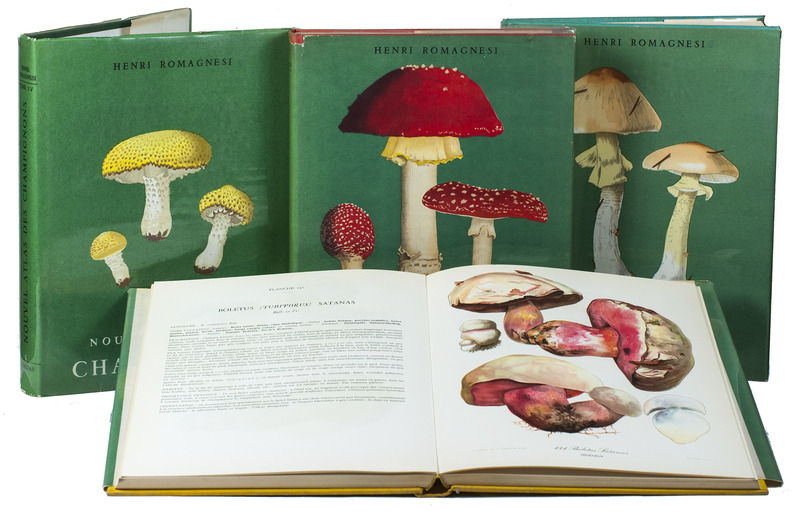 Complete set of the first edition of a beautifully and extensively illustrated standard work on mushrooms of the notable French mycologist Henri Romagnesi (1912-1999). In later editions the chromolithographed plates would be replace by cheaper colour prints.With the bookplate of the Danish mycologist Niels Fabritius Buchwald (1898-1986). Only some minor wear along the edges of the wrappers, otherwise the set is in very good condition. 8vo., with the half-title. 3rd [1st London] edition. London: Printed for A. Strahan et al. Some slight foxing to the first few leaves, expertly repaired closed tear to the fore-edge of I4. Contemporary half calf and marbled baords, smooth spine, ruled in gilt and without a label (edges a little rubbed and boards faded). Paper otherwise clean and crisp, a good copy. Het eiland Balie en de Balienezen.Amsterdam, G.J.A. Beijerinck, 1848. 8vo. With lithographed title-page and a folding lithographed map of the island Bali. Contemporary dark green half cloth. - Tiele, Bibl. 646; for the author: NNBW VIII, cols. 1014-1016. 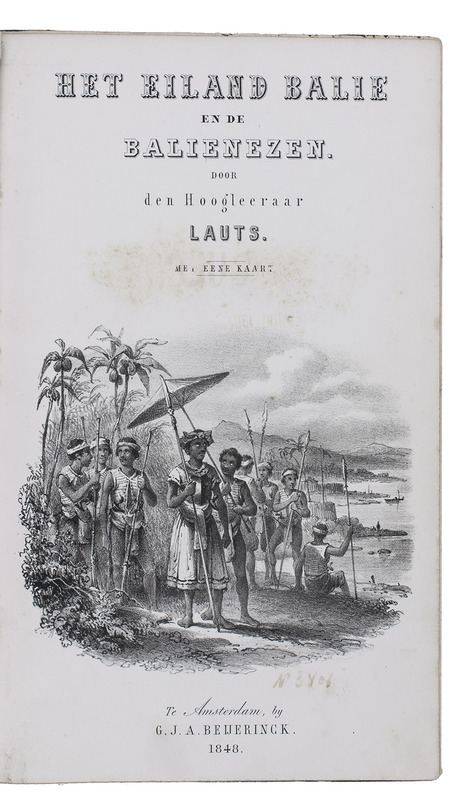 First and only edition of a description of the Indonesian island Bali and its people by Ulrich Gerard Lauts (1787-1865), a professor at the Royal Maritime Institute at Medemblik in the Netherlands. Without ever having set foot in the Dutch East Indies he wrote this book on Bali, which contains a general description of the island, its political system, the status of women, slavery, trade, customs (including the smoking of opium), religion, etc., and describes the relation with the Dutch from their first arrival in 1597 till 1848. The account was written when the Dutch were encountering difficulties with the virtually still independent local Balinese princes and rajahs.The three supplements contain details on the trade and shipping between Java and Bali in the years 1837-1846, a manifest for the Rajah of Beliling, a description of the state of the Dutch colonial army on Bali in 1846 and an official account of the expedition to Bali in 1848. Witha faint catalogue number and a library stamp. Browned throughout, with some spots, some wormholes throughout with loss of a few letters, two marginal tears along the folds of the map. Binding rubbed along the extremities. A fair copy.